In the never-ending quest to find devices that make our rides easier, I stumbled upon a cell phone charger that just might help some riders make it through snow country. There seem to be two types of riders out there in regards to their level of stuff or gadgetry they carry on hand. First would be those that have to have every new gadget that comes down the pike. The second are the folks that want to keep things as simple as possible with no strings attached. That being said, the first piece of gear snowmobilers carry is a cell phone. I consider a cell phone a necessary evil when it comes to riding. I do not like to take or receive calls when I ride but the safety factor of having one in case of a trailside emergency outweighs all the disadvantages one could possibly think of. Safety first! We snowmobilers frequently ride in and out of cell phone coverage which can make for some frustrating dropped calls and garbled transmissions, but suffice it to say, most folks now view a cell phone as an extension of themselves. A “don’t leave home without it” mentality pervades our culture nowadays and as such, the cell phone has almost become part of our bodies! Oh well, the modern world at work! Naturally, I jumped at the chance when I received the RidePower cell phone charger made by SeaNick in Jacksonville, Florida for testing. Hey, what do people in Florida know about snowmobiling? Turns out they know a lot about power sports as their products are used for motorcycles, campers, personal watercraft, ATV’s and the like. As seen in the picture, there is a dual pin connection for 12 volt DC. Most sleds out there come with one of these type connections hidden somewhere, so hook up is a snap. Plug into this connector using the supplied cord and connect the other side to the phone and off you go. I find it nice to have a handlebar bag where I can store the cell phone while riding. 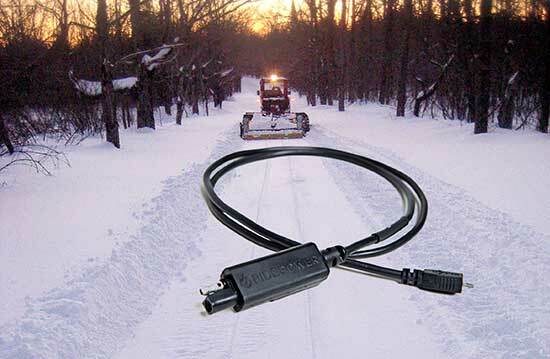 The cord is 43 inches long and is made up of very flexible and durable marine-grade rubber insulation that moves around easily in the cold that we usually experience during snowmobiling. None of that cheap vinyl that has a memory when it’s cold will suffice here. Okay, so now you ask what types of phones will this connect to? Right now an Android connection (Micro USB) is available and the owner of the company states that he is working with Apple for a licensed version for the iPhone, which will be coming out soon. Since this writer has an iPhone, SeaNick sent an iPhone adapter for the test, which fit right on the Micro USB cable. I worry that the adapter may get lost or broken so I’ll wait for the molded iPhone version before making the purchase. Most folks bring their supplied cell phone charger with them and plug it in at the hotel room or lodge after the day’s ride. Long distance saddle baggers might appreciate this accessory more than others. The other consideration is if your home charger breaks you now have a backup charger on hand. Can’t beat that! Charging time seems just fine when hooked up to the sled. The RidePower will help a weakened battery along when connected and give you the extra power you need to finish that important call. The Micro USB charger lists for $89 and was on sale for $45 in January. I give the RidePower a rating of four and a half out of six carbides for its premier design, ease of installation and simplicity. Downsides are the iPhone cable not being available yet, and another cord to deal with and possibly lose. Check out their website at RidePowerUSA.com.